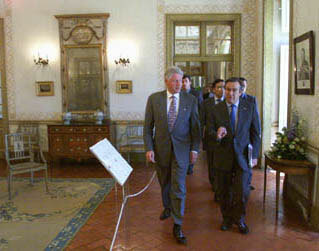 After the US-EU Summit Meeting in the Throne Room of Queluz Palace, President Clinton walks with Prime Minister Guterres to the Ambassador's Room for a US-EU working lunch. 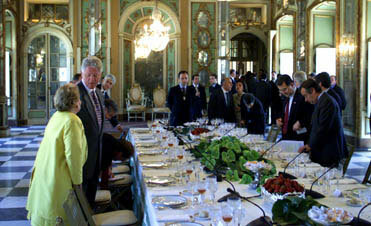 Inside the Ambassador's Room, Secretary of State Madeline Albright speaks to the President before the US-EU working lunch begins. 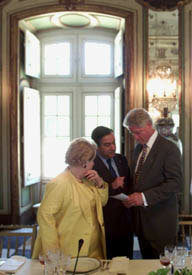 Secretary Albright, Prime Minister Guterres, and President Clinton discuss some issues prior to the US-EU working lunch. 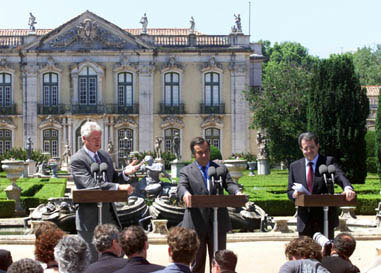 In the garden of the Queluz Palace, President Clinton, Prime Minister Guterres of Portugal, and President Romano Prodi of Italy answer questions during a press conference.